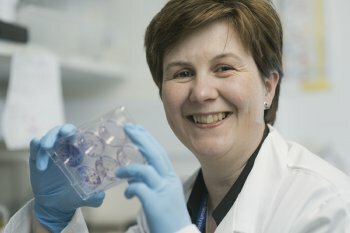 Researchers from the University of Ulster have been awarded a £214,000 grant to investigate a new drug combination to help reduce the spread of prostate cancer to other parts of the body. The team from the Biomedical Sciences Research Institute have been awarded one of 17 Prostate Cancer UK grants as part of the first wave of funding through the charity’s ambitious new research strategy. As part of its MANifesto, Prostate Cancer UK has pledged to find answers to some of the most important research challenges facing the disease today. The charity is injecting a colossal £11 million into research this year alone to focus on the key areas of understanding risk, improving diagnosis of the disease and improving treatment options for men living with it. Dr Iain Frame, Director of Research at Prostate Cancer UK, said: “Due to a long legacy of underfunding and neglect, we still know shockingly little about why prostate cancer kills 10,000 men every year. Dr Jenny Worthington, who will lead the team at the University of Ulster said: “Our study aims to improve the treatment of advanced prostate cancer, for which there are currently very few treatments available. “We will research a new drug combination therapy which aims to specifically target aggressive prostate tumours to control their growth and, most importantly, reduce the number of tumours which form in other areas of the body. The grants were awarded via a competitive process, and were subject to detailed assessment from external peer reviewers and the Prostate Cancer UK Research Advisory Committee. All 17 of the projects which are to receive funding were chosen because of their extremely high quality and relevance to men with prostate cancer. The Biomedical Sciences Research Institute was ranked number one for research power in the last Research Assessment Exercise in the UK.